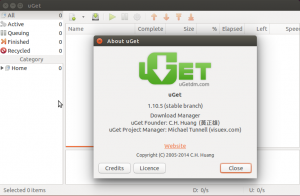 uGet is a VERY Powerful download manager application with a large inventory of features but is still very light-weight and low on resources, so don't let the impressive list of features scare you into thinking that it "might be too powerful" because remember power is good and lightweight power is uGet! Downloads Queue: place your downloads into a Queue to download as many, or as few, downloads as you want simultaneously. 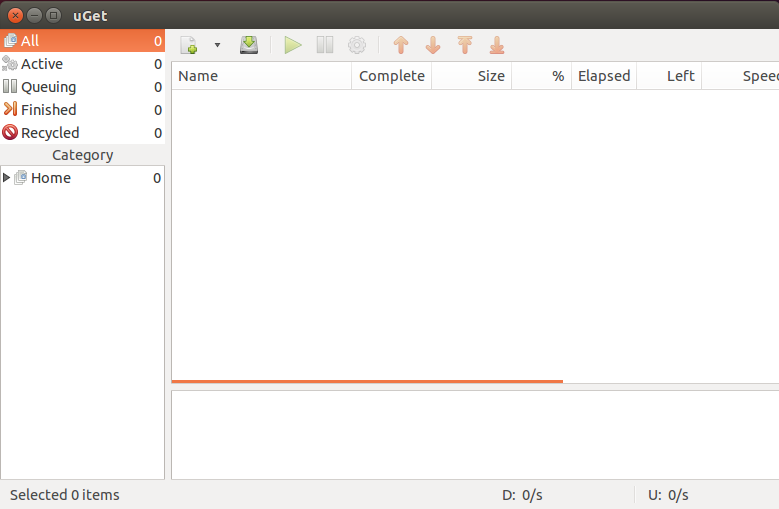 As a download finishes the queue will automatically start downloading the remaining files. Advanced Download Categories: unlimited categories to manage your downloads...scroll down for Category specific features. Clipboard Monitor: specify the types of files (via extension) that you want to monitor and any time you add them to your clipboard it will prompt to download the copied files. (universal browser integration) -- also works with batch downloads. Batch Downloads: allows the user to add an unlimited amount of files at one time to the queue for downloading...scroll down for Batch specific features. Multi-Connection* (aka Multi-Segment): up to 20 simultaneous connections PER download -- uGet's Multi-Connection feature also utilizes adaptive segment management which means that when one segment drops out then the other connections pick up the slack to ensure optimal download speeds at all times. This also applies to segments that become drastically slow due to server limitations. FTP Login & Anonymous FTP: supports downloading from anonymous FTP as well as login support via Username & Password for private/protected FTP servers. Scheduler: scheduling of when uGet is allowed or not allowed to download files. FireFox Integration via FlashGot: Clipboard Monitor is all you need for browser integration really but FlashGot is a separately supported FireFox addon so we have made it compatible with uGet. Quiet Mode: allows downloads to be added to a specific category automatically and begin downloading automatically, skipping the dialog properties popup. Robust Keyboard Shortcuts: lots of keyboard shortcuts like the typical Ctrl + N (New), Ctrl + Q (Exit App) but also select a download and press Delete to remove the entry from Download History or Shift + Delete to remove the entry and to delete the downloaded file. Other download specific shortcuts include Return & Shift + Return to open a download via default application & to open the containing folder of a download respectively. Computer Shutdown After Completion: optional feature to turn off your computer after all files have finished downloading, perfect for large download sessions that will take overnight while you sleep. CLI / Terminal Usage Support: ability to use a command line or terminal to download files. 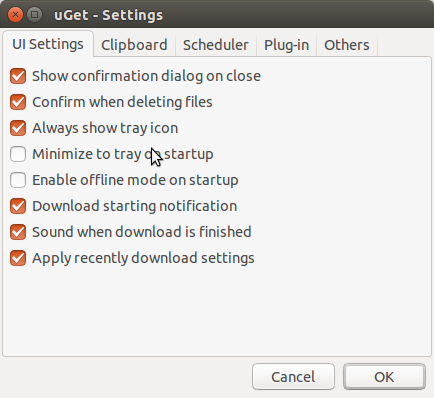 Folder Auto-Creation: if you provide a path to save a file but the folder doesn't exist uGet will create it for you automatically in order to save the file there. Download History Management: keep a history of downloads for finished entries and recycled entries up to 9,999 files per list, or automatically delete the oldest entries once your custom limit has been met. 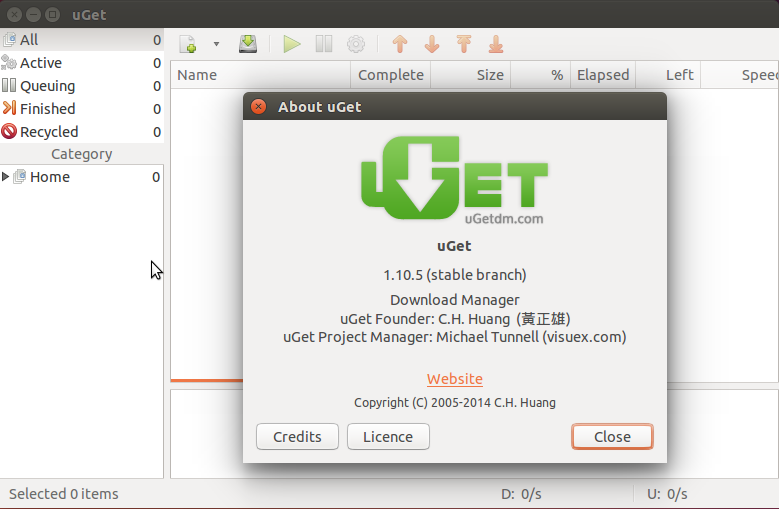 Multi-Language Support: uGet supports 20 languages which includes: Arabic, Belarusian, Chinese (Simplified), Chinese (Traditional), Czech, Danish, English (default), French, Georgian, German, Hungarian, Indonesian, Italian, Polish, Portuguese (Brazil), Russian, Spanish, Turkish, Ukrainian, and Vietnamese. Category Defaults for All Individual Download Features: below you will find Individual Download features, all of these features can also be set via category properties as Category Defaults and can be separately configured per category. Individualized Category Settings: each category supports separate defaults for advanced category and file management. Advanced File Management: set each category to a specific folder on your computer to easily organize your files before you even download them. 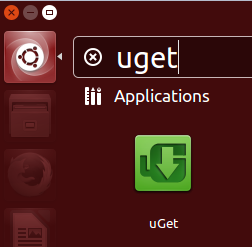 You can also rename, move and delete files from inside uGet. Active Downloads Limit Control: specify how many downloads each category is allowed to run simultaneously. Clipboard Batch: copy as many files as you want to your clipboard and uGet will detect all of the files that match the extensions listed in the Clipboard Settings allowing you to easily add multiple files to the queue from any other program. URL Sequence Batch: download a batch of files from the same server that has similar filename in a sequence like "file-01", "file-02", "file-03", etc. -- watch the video tutorial linked below for more information on this feature. HTML File Importing: import a list of an unlimited amount of URLs to download from via a .html file. TXT File Importing: import a list of an unlimited amount of URLs to download from via a .txt file. FlashGot Selection: use the FlashGot addon to send a batch of URLs to add to your uGet queue. Export All Downloads: exports all URLs in the Downloads History to a .txt file for use on your other computers. Proxy Server Support: supports the ability to download a file behind a proxy server allowing users to get past any access restrictions placed on the current network they are connected to. Immediate & Manual Start Control: choose whether to start the download immediately or to wait until you manually start it. Speed Limit Control: control the maximum Upload & Download speeds that uGet should utilize per download or per category. 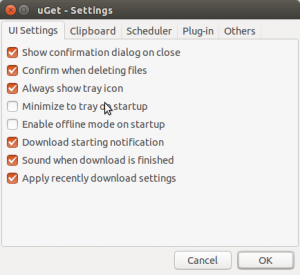 Advanced Filename Overwrite (optional): uGet will use whatever filename the download is set to but this feature allows you to customize the filename before it is downloaded. Retry Limits & Delays: customize the maximum amount of times to retry a failed download and how long to wait between retries. HTTP Referrer Support: save the HTTP Referrer for later use, such as re-downloading. Cookie Data Support: allows a user to provide specific session data via a cookie file. User Agent Control: modify the user agent a server sees to ensure downloading when servers have odd restrictions. Server Timestamp Retrieval: retrieves the current time of the server the file is downloaded from.